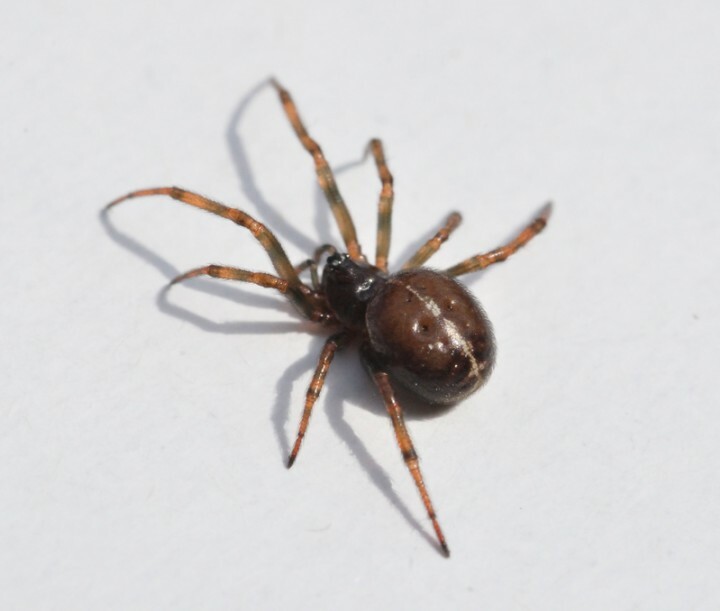 Steatoda bipunctata, copyright Roger Harris. Steatoda, false widow spiders, are a cosmopolitan genus of dark-coloured cobweb spiders. A number of species in this genus are found in association with humans. Characters (from Levi 1962): Medium-sized to large, usually dark in coloration. Colulus very large. Chelicerae armed with a tooth or several teeth on anterior margin; posterior margin of female chelicerae without teeth. Abdomen subspherical. Males often with enlarged chelicerae and a sclerotized ring around pedicel on anterior end of abdomen. Abdomen of most species with white line around anterior of dorsum, in addition to other lines or spots. [E07] Elliott, M. G. 2007. Annotated catalogue of the Pompilidae (Hymenoptera) of Australia. Zootaxa 1428: 1–83. [GLV14] García, L. F., M. Lacava & C. Viera. 2014. Diet composition and prey selectivity by the spider Oecobius concinnus (Araneae: Oecobiidae) from Colombia. Journal of Arachnology 42 (2): 199–201. Levi, H. W. 1962. The spider genera Steatoda and Enoplognatha in America (Araneae, Theridiidae). Psyche 69: 11–36.